There are a lot of ways to pay the bills in this world. Some just choose more dramatic ways than others. Take this man for instance. 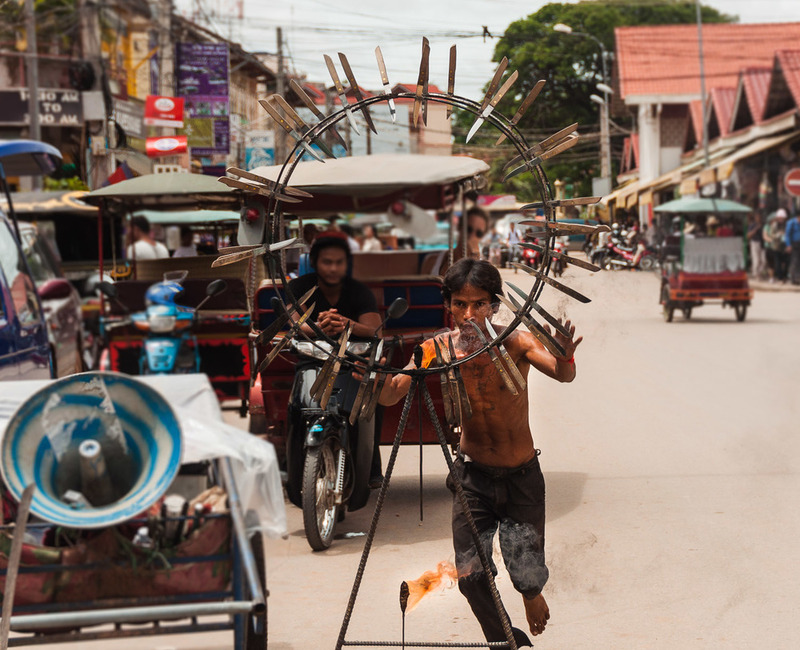 He's set up shop working the street in the center of Siem Reap in his own way, and he's about to put on a show. He pulls his trailer down the street, and double-parks it in front of a motorcycle and a minivan, with his torturous tools of the trade just an arms-length away. The trailer has the worst sounding horn loudspeaker you've ever let pierce your eardrums, and a cheap mp3 player cranking out the lo-fi tunes at maximum volume. A short sprint, and he leaps, diving through a hoop made of rebar and surrounded by steak knives . He tucks and rolls, landing on a makeshift mat he placed on the street to cushion his fall. His well-trained form leaves him without a scratch. You see, you've got to hustle to make it in Siem Reap. Too many tuk-tuk drivers, too many restaurants, too many people vying for the same cash in this economy driven by tourists. For many people coming here from the surrounding villages, Siem Reap is the big city. Your chance to make it, and bring some cash to your family who's farming their little plot, just struggling to get by. To make a better life. And now he's set to make his mark, and out comes the fire. Now, given that the summer sun was a scorcher, it's surprising he even needed a match at all to ignite the flame he was about to consume. He parades around only briefly, raising the flame high above his head, before tilting the bar down and towards his mouth. Head back, mouth open, flame on tongue. The heat from the fire bends the air around his face. But don't worry, he's a professional. Check out that tattoo on his chest. If you enjoyed this series, check out my other work on Cambodia, Asia, or my other photo stories from around the globe.